If you are ever looking for a new vacation destination, St. Thomas is the place to go! My family and I took an amazing trip down to the islands and it was absolutely breathtaking! We stayed on St. Thomas, but also took a day trip to snorkel and see some other beaches at St. John. The weather was hot, humid, sunny, and every day was a beach day! 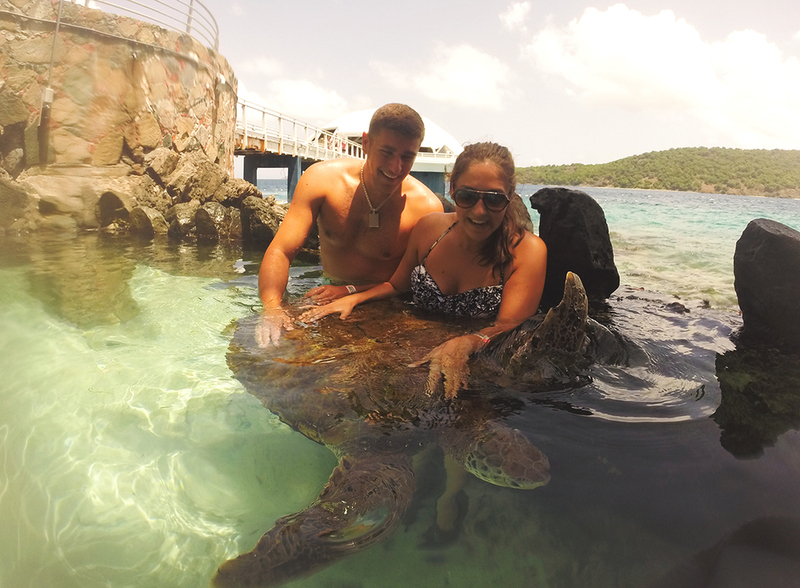 While we were there we did a green sea turtle encounter, and got to play with these beautiful 180-250 pound creatures. It was an experience I will never forget. Little did we know we would end up seeing sea turtles and even stingrays regularly while snorkeling at all of the different coves and bays. Along with stopping at many beaches, snorkeling, exploring, eating (AMAZING food! ), and shopping, we did a zipline adventure tour in the mountains overlooking one of the most fantastic parts of the island... Magens Bay! That beach has been ranked as one of the top ten beaches in the world, and when we got there we knew exactly why. The sand was warm on our feet, the water perfectly clear, wonderful sea life, and a view you can't find anywhere else! I wanted to share some photos of both the underwater and land scenery. Some of these images are from my dads underwater camera, but most are from my GoPro. I will be sharing my GoPro video soon, once I get all of the footage together! I hope you all enjoy the photos!